Acoustic measurements are widespread for assessing wood and wood-based materials. These measurements usually involve the propagation velocity of sound or ultrasonic waves to estimate strength or pinpoint defective locations. Velocity measurements are useful for the inspection of lumber, beams in structures, transmission poles, wooden bridges, glued-laminated beams, etc. Other acoustic parameters are used for exploring the properties of wood, as well. This paper presents an investigation concerning the suitability of a special amplitude-technique for wood. The study included the examination of the acoustic coupling between the wood and the signal generator, the damping of the signal in wood, the effect of sloping grain, and the equipment’s capacity in detecting artificial defects (sawn notches). The results revealed that a uniform wave-front develops at a distance of 60 cm from the signal source, that the amplitude decays exponentially with distance, and that the amplitude is a considerably more sensitive defect-indicator, than propagation velocity. Acoustic measurements have become common in wood testing. By means of sonic and ultrasonic velocity, one can test standing trees [2, 15], lumber [6, 9, 11], built-in materials , beams in wooden bridges  and panels . Velocity is capable of indicating defects, but only if the sensors are placed close to the defective area . Involving other acoustic parameters can improve the test’s sensitivity, and its ability to detect decayed areas. These can be the damping , maximum amplitude [3, 12], contained energy [5, 16] and spectral parameters [1, 8] of the signal. Acoustic methods can even ascertain the sound length of a pole’s underground portion . The goal of our investigation was to improve acoustic testing methods of wood by inspecting the – previously unexplored – magnitude of the first received signal. This technique is used in the evaluation of seismic impulses, but the literature does not contain any example for its application in material research. Evaluation of the complex wave-sequence arriving to the receiver is a difficult task. The early portion of the signal, however, is certainly a p-wave; slower components (shear and surface waves) and reflected waves are not present at this stage. A special advantage of the method is that the signal is effected solely by the material in-between the two receivers, thus its evaluation is relatively straightforward. The difficulty in measuring the low signal levels involved presents the only drawback. The raw materials of the test included Norway spruce (Picea Abies L.) and beech (Fagus Silvatica L.) lumber. The cross-section of the boards varied between 2x4 cm through up to 10x12 cm, while their length ranged from 80cm to 2m. The material was kept at room temperature in an unconditioned environment that produced moisture contents between 11% and 13 %. The number of the specimens exceeded 100. The signals were excited by accelerometer, using a 127 V impulse that lasted for 20 ms. The impulses followed at 2s intervals. Figure 1. shows the excitation signal and a typical receiver signal as well. The voltage of the device and the length of the impulse is adjustable between 70 … 127 V, and 7 … 40 ms, respectively. To facilitate in-situ applications, power is supplied to the device from a 9V battery. Fig 1: The excitation signal(thin line) and a typical receiver signal(thick line). The project also included the development of an optimal accelerometer-pair for the transmission of signals (Figure 2.) These consist of receivers placed in an aluminum case. 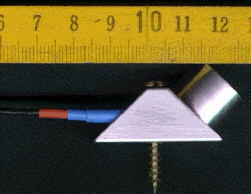 The piezoelectric crystal is placed at an angle of 45° relative to the coupling surface. 50 mm long, 3-mm diameter screws fastening the accelerometer to the surface of wood can provide approx. 3-4 MPa surface pressure, which is ideal for coupling. The sensitivity of the detectors is 32 mV/g. The design of the detectors is such that they can operate as a sound source. This means that they can emit a ultrasonic impulse under the excitation of several hundred volts for a prolonged time without failing. Figure 3. shows the measurement configuration. For the evaluation of the signals, we used a storage scope connected to a computer. The generator’s timing output was used for triggering the scope. The sampling frequency of 5 MHz provided ample accuracy for registering the transmitted ultrasonic signal, that had a frequency of 48 kHz (about 100 measurement points per period.) This kept the sampling error below 0.5%. The relative error resulting from the 8-bit amplitude-measurement is somewhat higher, about 1…1.5%. Fig 3: The applied measurement setup. First, we used grease as a coupling agent, to eliminate the air boundary layer between the wood and the detectors. Grease, which is a proven coupling agent for metals, has two disadvantages when used for wood; it soaks into the wood, changing its properties, and is a messy, alien substance from wood. Experimenting with other materials revealed that a textile-based, nr. 120 sandpaper provides equally good coupling. Using the same sample and detector distance provided the same signal level for the two coupling agents. The required surface pressure was also a matter of interest. To account for the effect of hardness, we used norway spruce and beech samples. Both wood species had planed surfaces. The signal source was fastened by screws, while the surface pressure was adjustable on the receiver side. Figure 4. shows the amplitude as a function of surface pressure. The amplitude does not change significantly above 1.2 MPa and 2.2 MPa for spruce and beech, respectively. An arc tan function shows good fit on the experimental data. This agrees with theory inasmuch that increase in the surface pressure does not significantly improve coupling after a certain level. where a and b are the incident and refracting angles; C//, Cr, are the sound velocity in wood parallel and perpendicular to grain and CAl is the sound velocity in aluminum. Since damping is very high perpendicular to the grain, these waves degenerate quickly, b soon approaches 90°, and the waves will propagate in the grain direction. As the speed of sound is highly variable in wood, it is impossible to find any single optimal angle of incidence. It is generally true, that increasing the angle leads to higher amplitudes, but it also enlarges the coupling surface, thus requiring greater coupling forces. The 45° angle used in our accelerometers is based on the above considerations, and is a reasonable compromise. The purpose of this research segment was to investigate the wavefront near to the transmitter, and in grater distances. The part of the body where there are significant differences in the signal within a cross-section is defined as near-field. The region where the wavefront is homogeneous within a cross-section is called far-field. A 2 x 10 x 100 cm board was used to examine the wavefront within the material. The measurements consisted of actuating identical signals from the transmitter, while placing the receiver at various points along and across the board. Figure 5. shows the experienced signal pattern. According to the measurements, the far-field starts at approx. 60 cm from the transmitter. Fig 5: The signal amplitude distribution over the sample surface. The distance between the transmitter and the receiver obviously effects the amplitude of the received signal. Large number of measurements was accomplished on lumber with various cross-sections, ranging from 2 x 4 cm to 20 x 21 cm. All of these measurements showed that the amplitude decreases exponentially with distance. Figure 6. demonstrates this trend. Fig 6: The amplitude decreases exponentially with distance. Fig 7: The amplitude * cross-section parameter is independent of the cross-section. It is important to mention that figure 7. does not contain measurements in cross-sections larger than 100 cm2. These specimens tend to contain defects (checks, knots, etc.) that alter the acoustic characteristics of the sample. The application of the present method, therefore, is limited to smaller, defect-free cross-sections. Using a previously developed practice, defects were simulated by sawing two-millimeter-wide cuts perpendicular to the longitudinal axis of the lumber. The position of the cut was halfway between the transmitter and the receiver, placed 60 cm apart. The testing method included deepening the cuts and measuring the velocity and amplitude in 5-6 consecutive steps. Fig 8a,b: The effect of the saw cut. (a)The amplitude versus dept of saw cut. (b)The velocity versus dept of saw cut. Figure 8a. shows two typical result sets. In the case of straight-grain, knot-free material, the amplitude decreased proportionally with the remaining cross-section. Sloping grain broke the linearity of this pattern. A consistent decrease, however, is still evident in this case. These results indicated that sloping grain has a significant effect on the amplitude, and led to the side study described in the next section. Figure 8b. shows the response of velocity to the same cuts. Shallow cuts caused essentially no effect on velocity, and the effect of larger cuts is only moderate. These results show clearly that amplitude is a much better defect indicator compared to velocity. This study was triggered by the amplitude’s apparent sensitivity to sloping grain. To investigate this phenomenon, we used a tangentially cut spruce board. Depending on the relative position of the accelerometers placed at a distance of 10 cm, the signal was propagated in different directions. In our measurement, the grain orientation ranged from longitudinal to tangential, with 15° increments, and the amplitude and the velocity were measured. The transmitted signal was the same in each measurement. Figure 9. demonstrates the measurement results. Both sound velocity and amplitude decreased significantly between 0° and 30°. This decrease is, however, much more dramatic in the case of amplitude than for velocity; amplitude falls back to 1/6, while velocity reduces only by a factor of 1.7. A slight deviation from longitudinal causes a significant loss in amplitude, which shows how much the lateral damping of wood inhibits the propagation of sound. Fig 9: The amplitude and transit time versus grain angel. Propagation velocity is more sensitive than the amplitude above 30° grain angle, and above 60°, amplitude changes very little. However, most applications (e.g. lumber grading) involve small grain angle deviations. When the slope of grain is not more than 30°, amplitude is almost four times more sensitive than the velocity of sound, and its use is worthy of consideration. In the meantime, in other applications (like flaw-detection) this high sensitivity might be problematic. Textile-based sandpaper grants adequate coupling between the accelerometers and wood. The surface pressure should be between 1.2 – 2.2 MPa, depending on the surfaces. An incidence angle of 45° is satisfactory for longitudinal wave-propagation. The amplitude of the first received signal decreases exponentially with travelling distance. Homogeneous wavefront is established at 60 cm or farther from the wave source. After this range, the amplitude depends only on the cross-section, the travelling distance, and material characteristics. The first received amplitude is much more sensitive to defects in material, than propagation velocity or amplitude ratio. Amplitude is very sensitive to sloping grain, especially at small grain deviations. This can be very useful for detecting sloping grain in lumber, but presents a technical difficulty in other uses of the method. The above results demonstrate that the amplitude of the first received signal is excellent for assessing material properties, detecting defects, or indicating sloping grain in wood. It is powerful enough to be used in itself, or in combination with other acoustic parameters. Relating this parameter to the mechanical characteristics of wood, however, requires further research. The developed transmitters have excellent potentials in some alternative areas of wood research, too. They can be used for assessing ultrasonic propagation velocity in saplings, to facilitate the sublimation of species with superior elastic properties. Another example is the evaluation of veneer MOE in arbitrary directions. This research effort was supported by OTKA (Hungarian National Research Fund). The measurements took place in the OTKA Regional Instrument Center in Sopron, Hungary. V. Galvan-Llopis et all. (1994): Strength Estimation of Decayed Timber in Old Buildings by Means of Ultrasonic Device; Proc. of the First European Symposium on Nondestructive Evaluation of Wood, pp: 156-170. F.-W. Brץker at all. (1994) Ermittlung der Festigkeiten von Bauholz mit Hilfe von Ultraschallaufzeit und Ultraschalldampfung; Proc. of the First European Symposium on Nondestructive Evaluation of Wood, pp: 225-231. J.L.Sandoz, T.Dirand (1994): Wood Testing Using Acousto-Ultrasonic; Proc. of the First European Symposium on Nondestructive Evaluation of Wood, pp: 232-239. B. Matthews at all. (1994): The Effect of Moisture Content on the stress wave parameters; Proc. of the First European Symposium on Nondestructive Evaluation of Wood, pp: 261-269. K.Kruse, at all (1996): Non-contact Method to Determine Ultrasonic Velocity of wood based Panels; Proc. of the 10th International Symposium on Nondestructive Testing of Wood, pp: 83-91. S.Bozhang, R.Pellerin (1996): Nondestructive Evaluation of the Degree of Deterioration in Wood; Proc. of the 10th International Symposium on Nondestructive Testing of Wood, pp: 99-115. R.J.Ross, at all. (1996): NDE of Logs with Longitudinal Stress Waves; Proc. of the 10th International Symposium on Nondestructive Testing of Wood, pp: 117-123. R.W.Anthony at all. (1996) Use of Stress Waves to Evaluate Timber Pile Length; Proc. of the 10th International Symposium on Nondestructive Testing of Wood, pp: 125-133. J.L.Sandoz (1996): Ultrasonic Solid Wood Evaluation in Industrial Applications; Proc. of the 10th International Symposium on Nondestructive Testing of Wood, pp: 147-153. M.Tiitta at all (1998): Using Spatial Averaging and Relative Measurement Techniques to Improve Acousto-Ultrasonic Decay Detection Efficiency; Proc. of the 11th International Symposium on Nondestructive Testing of Wood, pp: 185-194. R.E.Emerson, at all (1998): Nondestructive Testing of Large Bridge Timbers; Proc. of the 10th International Symposium on Nondestructive Testing of Wood, pp: 175-184. F.Divףs at all. (1998): Evaluation of the wooden structure of a Baroque Palace in Pבpa, Hungary; Proc. of the 11th International Symposium on Nondestructive Testing of Wood, pp: 153-159. K.Betge, C.Mattheck (1998): Instruments for Detection and Evaluation of Decay and Wood Quality in Standing Trees; Proc. of the 11th International Symposium on Nondestructive Testing of Wood, pp: 105-115. M.Schafer at all (1998): Ultrasonic Inspection and Analysis Technique in Green and Dried Lumber; Proc. of the 11th International Symposium on Nondestructive Testing of Wood, pp: 95-102. T.Tanaka, F.Divףs (1998): Nondestructive evaluation of residual bending strength of wood with artificial defects by stress wave; Proc. of the 11th International Symposium on Nondestructive Testing of Wood, pp: 83-91.